We are working with industry and the community to manage and conserve Western Australia's fish and their aquatic habitats. 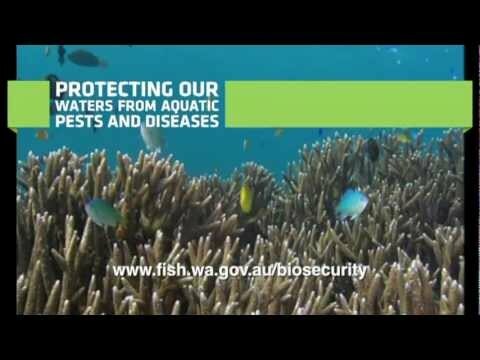 An important part of this work is protecting our environment and fish resources against introduced pest species. Pests and diseases pose a serious threat to the State's aquatic ecosystems, as well as the tourism, aquaculture and fishing industries. WA is currently free from many of the introduced species and diseases common in other areas of Australia and overseas, but this will only continue if we remain vigilant in our efforts to exclude these invaders. This means being able to identify aquatic pests and aquatic diseases and you can play an important part in helping to do this. These diseases pose a threat to our fisheries and aquatic resources and the fishers and communities who access them. For example, the pearl oedema disease nearly wiped out WA’s silver pearl industry; killing 2.8 million newly-seeded silver-lipped oysters in 2006. In response to this threat, our Aquatic Health unit provides a diagnostic service for fish diseases, surveillance and monitoring, policy advice, training, research and development. If you suspect you have identified an introduced freshwater pest, marine pest or aquatic disease in a WA aquatic environment, please report it to us. We publish a series of biosecurity alerts. To keep track of where aquatic pests and diseases have been identified, we maintain an aquatic pest database. Details include reports from the public, research institutions and government authorities and helps us build a comprehensive picture of the distribution of aquatic pests. The information is used to monitor if an aquatic pest is spreading within the State and assess how we should target our pest control and eradication efforts. Our interactive Freshwater Fish Distribution website provides historical records on the distribution of native and introduced fish species and crustaceans in WA. We also have maps charting where marine pests have been detected in WA and the Eastern States, along with the main shipping routes into WA from overseas and interstate.